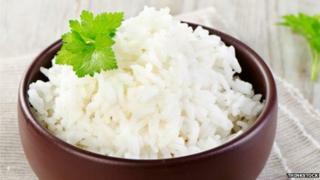 Scientists say they have found a way to make rice less calorific - boil it with coconut oil and then refrigerate for half a day before eating. According to the Sri Lankan researchers, treating rice in this way reduces its calories by up to 60%. They told the American Chemical Society how the method made the starch in the rice less digestible so the body took on less fuel than it otherwise would. UK nutrition experts cautioned there was no quick fix to losing weight. Starchy foods such as rice, which are known as carbohydrates, are a good source of energy. When we eat them, our body breaks them down into simple sugars. Any that is leftover will be stored by the body and quickly converted to glucose as needed. But too much glucose circulating in the blood can ultimately end up being stored as fat. Scientists have been experimenting to see if they can alter foods to trick the body into absorbing less fuel to keep blood sugar, and calories consumed, lower. UK researchers have already shown that cooking and then cooling pasta will create a smaller glucose peak - even if you then reheat the cold pasta. And investigators from Sri Lanka say the same is true for rice. They tested 38 varieties of rice to find the best way to boost something called "resistant starch". This type of starch is more resilient to the enzymes the body uses to break down carbohydrates in the gut, meaning less of it is absorbed. And, according to the researchers the best way to make it is to simmer the rice for 40 minutes with a teaspoon of coconut oil, then let it cool and keep it refrigerated for 12 hours. Researcher Sudhair James said: "The cooling is essential because amylose, the soluble part of the starch, leaves the granules during gelatinisation. "Cooling for 12 hours will lead to formation of hydrogen bonds between the amylose molecules outside the rice grains which also turns it into a resistant starch." He said reheating the cooled rice was fine too - it would not affect the resistant starch level. The team is now checking out which varieties of rice might be best for the job and whether other cooking oils will also work. Sarah Coe, an expert at the British Nutrition Foundation, said resistant starch could have a number of health benefits, as it appears to improve digestion and gut health and can help regulate blood sugar levels. But she said more studies were needed to examine any potential health effects of consuming this type of rice. Reheating cooked rice can be risky because some food poisoning bugs can survive cooking. If cooked rice is left standing at room temperature, the bacteria can multiply, which is why rice should be served either hot or cooled and then stored in a fridge. Ms Coe pointed out that although rice and starchy food are an important part of a healthy, balanced diet, rice consumption in the UK is generally low. "Therefore, lowering the calorie content by the proposed cooking method will not make a significant difference to obesity levels in the UK." British Dietetic Association spokesperson, Priya Tew, said: "This sounds like it has great potential, however there are no human studies on it yet. It is fantastic that research is being done into different cooking methods. "I would recommend people stick to cooking rice using their normal method until there is more information available." Dr Denise Robertson, a nutrition expert at the University of Surrey, said: "Seeing the results of the volunteer tests on blood glucose that are currently underway will be vital in understanding the true potential of this research and whether this can be extrapolated to carbohydrates in the Western Diet."